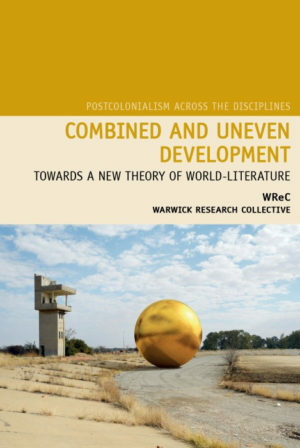 This book is the 17th in a series titled “Postcolonialism across the Disciplines.”The authors acknowledge the key figures associated with previous attempts at investing postcolonial critique with relevance in terms of its critique of western imperialism. By subordinating the idea of global literature to world literature, the authors make clear the inadequacy of the existing terms in the sense that they fail to account for the “singularity” of modernity as a deterministic category in which the world is trapped and divided at the same time. The idea of global literature, may, for instance, reflect the contemporary restless movement of people across spaces, but it remains inadequate. They equally reject Spivak’s optimism about comparative literature’s capacity to open up literary scholarship to “a level playing field (22), because as they explain, “comparative literature — in the Euro-American academy, at least — has pretty much always commenced from an unalloyed and irrevocable Eurocentric particularism” (23).”The inadequacy of the previous terminologies, they contend, stems from the tendency to undermine how “modernity” as a driving force in the world-system. They argue further that the ascription of agency to capital has created a sort of social, temporal, and spatial contradiction, accounting for why it is possible talk about “uneven and combined development (10). In this case, the variables for development in one region simultaneously result in underdevelopment in another. As expected, theorists like Edward Said and Fredric Jameson, among others, are acknowledged for their interventions in the understanding of postcolonial theory. The authors however, underscore the flipside of these postcolonial theorists’ work in terms of its failure to account for how world-literature should reflect the uneven development that capitalism as a global phenomenon engenders beyond colonialism. The aim of the text finds crystallization in the second chapter when the authors aver that the circulation of literary texts from different parts of the world, especially those considered to have been canonized, is not enough. Not only are these texts going to be unequally received, whether as originals or translations, they are also not likely to be equally evaluated precisely because the question of capital and unequal development in present market economy will affect these conditions of circulation, which are driven primarily by the forces of commodification. In clearer terms, difference and inequality in circulation are underscored by what the authors refer to as the “dialectics of core and periphery that underpin all cultural production in the modern era” (italics in the original; 51). While they provide a critical prolepsis about the texts selected for analysis in their subsequent chapters, the overall justification for the selection consists in what they term the “shock” of an uneven world-economy that strips certain spaces of agency while subjecting them to the whims and caprices of commodification. In their conclusion to the chapter, they illustrate the commodification of Latin America with the transition from realist writing to “irrealism” to reflect the compromise of the political dispensation. But the magical realism that resulted from the 1960s in the world literary market would later yield to a form of commodification that “has led to a stripping away of its original radical politics and emergence of reactionary forms consonant with the tastes of metropolitan cultural elites” (80). The third chapter, “Irrealism in Tayeb Salih’s Season of Migration to the North,” presents the first textual analysis illustrating the logic of the authors’ “world-literature” theory. It provides a concise yet rigorous introduction that locates Season of Migration to the North as a novel alive to the specific dimensions of what they term “peripheral modernism.” The impact of modernity on nations that have suffered colonialism demands that their response in textual terms take into account how “a world system [is] driven to expand into the non-capitalist worlds.” In the case of the Sudanese world captured in the novel, the internal contradictions created by capitalist modernity in the name of colonialism are compounded by the extant internal contradictions that draw a binary between the socio-politically privileged northern Sudan and the richly endowed but dispossessed southern Sudan. The authors contend that the Sudanese situation, as embodied substantially by Mustafa Sa’eed in Season of Migration to the North, “dramatize[s] the trauma of modernity: for here the precipitate and the selective introduction of capitalist productive and social modes into a non-capitalist environment produced incompatible material and existential situations, generating aesthetic forms encoding these disjunctions and constituting their stylistic peculiarities” (81). Therefore, even when the aesthetic peculiarities account in a sense for how a trope like magical realism is given accent in the work, the “critical irrealism” that results, even when appearing to thrive on imagination and the imaginary, is nonetheless reconciled to realism. They explain that this understanding is weaned on Lowy’s theorizing of irrealism. Irrealism’s credibility for its “foundational homage to realism,” finds its finest illustration in Mustafa Sa’eed’s character in the sense that the authors track a complex trajectory of his life from Sudan, Cairo,and to faraway England. His life thus shows how the contradictions of extant uneven development between Black African South and Arab North in Sudan are fused with the additional violences and contradictions of capitalist modernity at the advent of British colonialism. They argue further that the aesthetic of transition is underscored in not just the spectral and lycanthropics of the text, but also in the recurrence of anti-communist classics like those by Gogol and others as a way of affirming how the uneven development of the communist dispensation has resonances for the new ecological regime of petroleum extraction. The uncertainties that such realities of transition portend, they contend further, account for the privileging of science fiction in the post-Soviet aesthetics and a disposition towards speculation in the fiction, all of which find illustration in The Sacred Book of the Werewolf. The fifth chapter on “The European Literary Periphery” is significant by virtue of how it demonstrates the way in which postcolonial discourse tends to read Europe as one indivisible imperialist whole without acknowledging the presence of peripheral spaces of modernist capitalism within the continent. The authors list the peripheral spaces that are vulnerable within capitalist modernity, including Iberian Europe, Eastern Europe, the Gaelic, Baltic, Balkan regions, and even colonial homelands like the United Kingdom. Using sundry texts and authors, they argue that the exclusion from or reluctance of such spaces to embrace capitalist modernity creates instances of uneven development within Europe. Beginning with Peter Pist’anek’s Slovakian novel Rivers of Babylon, they show how the symbolism of a female strip act in a public space indexes the exhaustion that characterised the hurried transition from Soviet communism to post-Soviet neoliberalism, a shift that in itself harks back to the previous transition from feudalism to communism. They argue further that the transience of empathic response to the condition of the stripper underscores her vulnerability and speaks to the Slovakian condition of vulnerability; it also indicates how the transition has led to neoliberal profiteering on the part of others within the nation. In a similar vein, Spanish reluctance and resistance to the modernist agenda of centres in Western Europe, and the structural mismatch that results, find both content and stylistic reflection in the works of Baroja. Other peripheral spaces and their corresponding literary imagination relating the “shock” of modernist capitalism are: Reykjavik, Iceland and Glasgow, Scotland. All of the illustrations from Europe point to one thing: the affirmation of a “singular Europe” must also acknowledge its own uneveness in terms of the world-system economy and the literatures produced in such peripheral spaces continue to provide a necessary reflection on the inequality in continental Europe. The book’s last chapter reads a collection of short stories by Ivan Vladislavic as illustrative of the iconic symbolism of the city of Johannesburg in understanding post-apartheid South Africa, where the official collapse of apartheid and the transition into neoliberal capitalism laid the foundation for the penetration of combined and uneven development. Using Mandela’s symbolic invitation to western capitalist nations to extend their regime of neoliberalism to South Africa in the wake of apartheid, the authors illustrate how the anchoring of post-transition economy on the terms and conditions of GEAR (Growth, Equality and Redistribution) created a system of a desperate condition that mocks the decades-long struggle for freedom in South Africa. For, rather than pandering to the ideals imagined and proposed in the years of struggle for a better economic condition for all, especially previously disadvantaged groups, GEAR turned out to be an institution of orthodox neoliberalism. The uneven development that results finds many resonances in Vladislovic’s stories as spun around Johannesburg. The stories constitute a conscious aesthetics registering the paradox and contradictions of post-apartheid South Africa as a “local instance of a global trend underscored by the neo-liberal ‘supply-side’ economic orthodoxy” (146). The authors are quick to add that, beyond the global resonance, the condition that the aesthetics reflect are of the peculiarities that define South Africa’s past and continue to frame its present in a manner that translates into uneven development both in racial and economic terms. The complexities and complications that dog the post-apartheid present are rounded off with the story, “Engaging the Gorilla Cycle”. In the story, the “‘gorilla’ has multiple “referents” that underscore “the lineaments of a paranoid consciousness that inhabits the extreme city” (167). The central argument in Combined and Uneven Development is clear: literature and literary criticism cannot be about understanding rarefied texts wholly abstracted from the realities of a world-systems economy that casts certain spaces as core while inscribing others as semi-periphery and periphery. Texts are thus invested with credibility when they respond to both the otherwise global effects and local peculiarities of capitalist modernity and the contradictions they spin. In the same way must literary criticism be alive to this ubiquity of capital in framing social spaces. This is the logic of “world-literature” as an analytical category. Overall, the book radicalizes the understanding of world literature through the symbolic insertion of the hyphen in order to steer it away from the otherwise normative understanding of the term. It thus becomes a critical source material for scholars and critics interested in the deeper resonances of the world-systems perspective in the framing of literature from different regions of the world located in the global margins. Senayon Olaoluwa is of the Institute of African Studies, University of Ibadan, Nigeria where he coordinates a postgraduate programme in Diaspora and Transnational Studies. Some of his reviews and essays have appeared in Journal of Postcolonial Writing, African Affairs, English Studies, Current Writing, Critique: Studies in Contemporary Fiction, among others.